Welcome to your Oceanside hideaway. Grab the family and your pets (up to three!) and make your way to this beautiful 1930’s cabin in Oceanside, OR. You’ll be minutes from the beach and have a great view of the sunset from the main deck – or an unobstructed view from the tree deck. At 850 square feet there is plenty of room for you and your family to enjoy the wood stove fireplace, 32-inch HD TV, comfortable seating and fully-supplied kitchen. With two bedrooms (a master bedroom with a queen, second bedroom with a double) and a bunk bed room off the master bedroom the house comfortably fits six. Kids will love the vast stock of board games and beach toys. More evidence that you won’t have to overload the car can be found on the Amenities page. Two vehicles will fit alongside the cabin on its quiet, mostly full-time residential street. Please keep the noise to a minimum as you watch the sunset while barbecuing a lovely meal, waiting for the kids to return from boogie boarding. There are over 40 wetsuits stocked so there’s certainly one to fit everyone – nobody has to freeze in the water. 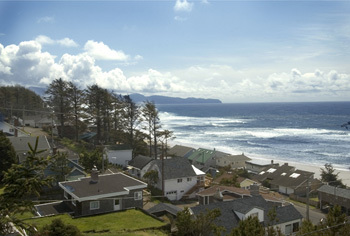 Oceanside is a beautiful ocean community about 80 miles west of Portland. With breathtaking rock formations just off the beach, it’s also home to sea lions, seals, pelicans, herons, tidal pools, and the largest colony of breeding Tufted Puffins. More local attractions are listed on our Links page. Copyright © 2012 Knotty Pine Ocean View Cabin. Website designed by Leland Scantlebury.